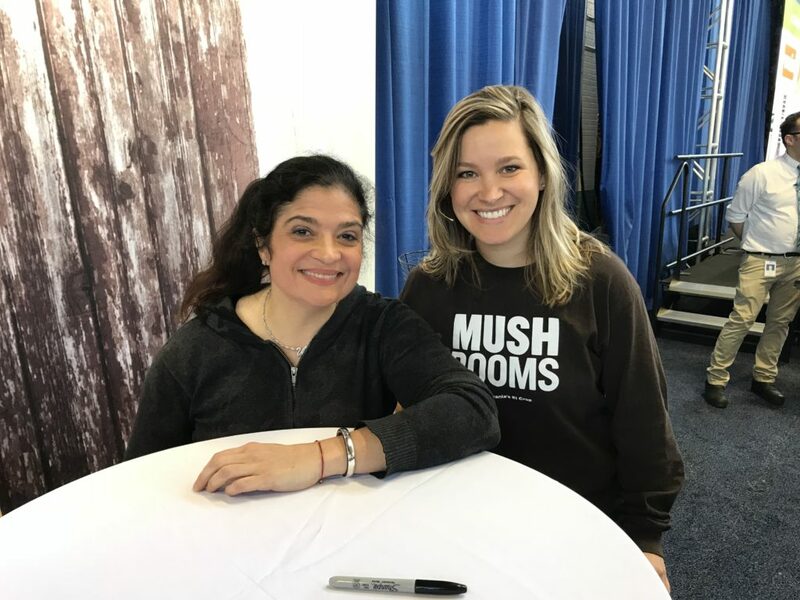 Our very own, Sam Snyder was able to meet & talk mushrooms with Food Network’s Iron Chef, Alex Guarnaschelli at this year’s PA Farm Show! Here’s the inside scoop on Chef Guarnaschelli’s delicious stuffed mushroom recipe & the secret ingredient that sets them apart from any stuffed mushrooms you’ve ever tasted. YUM! Make the stuffing: Heat a large skillet over medium heat. Add the olive oil, onions, garlic, thyme sprigs, and season with salt and pepper. Cook until the onions are tender, 3-5 minutes. Meanwhile, trim the stems of about ¼ pound of the mushrooms and slice them thinly. Add the sliced mushrooms and cook for 2 to 3 minutes. Add ¼ cup of the vermouth and cook until the mushrooms are tender and a lot of their liquid has evaporated, 8 to 10 minutes. Remove the thyme sprigs. Add the sour cream and allow it to melt over the mushrooms. Then add the lemon zest, half of the lemon juice, and the tarragon. Taste for seasoning and transfer the stuffing to a bowl. Cook the whole mushrooms: Rinse and wipe out the skillet and return it to medium heat. Add the butter and all of the remaining mushrooms, and season with salt and pepper. Add the remaining ½ cup vermouth and cook until the mushrooms are tender, 10 to 12 minutes. Taste for seasoning. Transfer the mushrooms to a baking sheet to cool. Stuff and bake the mushrooms: Remove the mushroom stems, set the caps aside, and coarsely chop the stems. Toss the chopped stems and ¼ cup of the Parmigiano-Reggiano with the stuffing. Fill each mushroom cap with stuffing, packing it in firmly. Arrange the mushrooms in a single layer on a large baking sheet. Mix the bread crumbs with the remaining ¼ cup Parmigiano-Reggiano and use it to top the mushrooms. Bake in the oven until they are hot inside and lightly browned on top, 5 to 8 minutes. Then run the mushrooms under the broiler for 1 to 2 minutes as a finishing touch. Sprinkle the remaining lemon juice over them and serve immediately.